Scheduled injuries are injuries specifically listed in Wis. Stat. § 102.52, consisting primarily of injuries/disabilities to the extremities. To calculate the potential value of your claim you take the number of weeks associated with the specific injury (chart below) multiplied by the percentage of disability assessed by your treating physician. You then multiply this number by the appropriate PPD compensation rate for the year the injury occurred in. (outlined below) This will provide you the maximum value of the permanent partial disability portion of your workers compensation claim. Ex: 5% PPD on left knee. Date of injury: January 1, 2014. 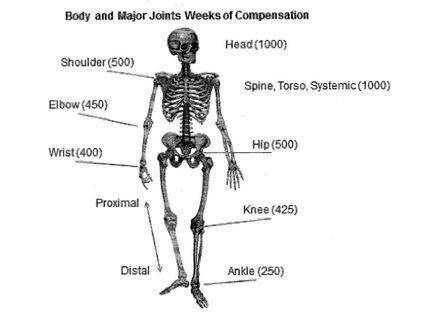 425 weeks for injury to knee multiplied by 5% = 21.25 weeks, payable at the maximum PPD rate of $322.00 = $6842.50. If you have been injured at work you need the legal representation that the experienced and skilled worker’s compensation attorneys at Tabak Law, LLC will provide. Your employer and their insurance company have their best interest in mind and will do their best to settle your claim for as little as possible; DO NOT allow this to happen, speak with one of our experienced attorneys today!